When faced with a difficult moral or ethical decision, what rudder do students use for guidance? At Jackson Academy, students now have an Honor Code and Pledge. The new student-governed Honor Code at JA expresses the values of the school community and helps students and adults strive toward personal honor and integrity in all dimensions of school life. A committee made up of students, faculty, parents, and administrators met during the fall 2017 semester to envision and develop the implementation of a formalized Honor Code. Three student members of the committee introduced the concept to students in eighth through twelfth grades at a convocation on Wednesday, January 23. Honor Code and Pledge: As members of the Jackson Academy community, we will maintain the highest standards of integrity and respect while striving to achieve excellence in and out of the classroom. As such, on my honor, I will not lie, cheat, steal, or tolerate those who do. Senior Class President and honor code committee member Dolph Maxwell told the assembly of students that rather than being merely a set of rules for students to follow, the Honor Code holds up a set of ideals to which each person in the community aspires, resulting in students who choose to do “what is right when nobody’s looking.” The ideals of integrity, respect, and excellence are at the heart of the code, to which each student will pledge as a member of the JA community. Honor code committee member and Student Body President Emma Ward recalled her experiences at Camp Greystone in North Carolina as an example of how an honor code had already influenced her perspective. “An honor code produces people whom younger people can look up to,” Ward explained. “It is something to strive toward and results in truly great people with integrity.” Ward led the assembly through the ratification process to approve the proposal, which the student body and faculty solidly voted to adopt. “I’m very proud of our student body for endorsing this,” said Dean of the Upper School Steve McCartney. Middle School Dean Matt Morgan agreed, noting that the student body has been working on “unpacking” the significance of the word “purpose” in the school’s mission. Morgan said that this honor code is “tangible evidence of the growth of the school in its character-ethical education journey.” He said the “common language, common feeling, and common motivation” help make the ongoing reflections about purpose and character real for students. Students will take part in a signing ceremony February 14 where they will affix their names to an Honor Code Charter during a ceremony with special guest speaker Dr. Mark Keenum, president of Mississippi State University. Dr. Keenum will speak about the importance of an Honor System to the culture of a school. The code and pledge with students’ signatures will hang in a prominent location of the school, said Avery Hederman, a student committee member who was instrumental in drafting the code. The signed document will be a daily reminder of the values sought in the classroom and in activities throughout the school community. On January 24 following the student presentation, Milne presented JA’s Honor Code, Pledge and procedural system to the leaders of Jackson Area Association of Independent Schools at that organization’s monthly luncheon. 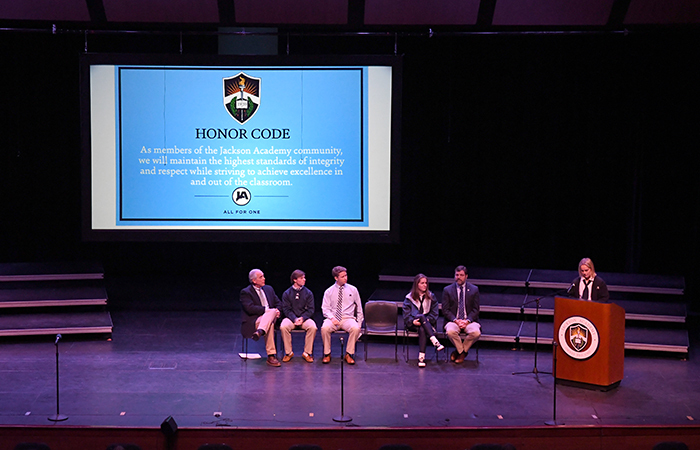 Student leaders Dolph Maxwell and Emma Ward again joined Milne for the presentation, giving the independent school leaders examples of what the Honor Code meant to them personally and what they hoped it would mean for their school. Copies of the documents were given to the leaders of those schools in attendance. The spirit of an honor code has been within the DNA of JA for decades, with students, teachers, and administrators espousing principles of integrity, respect, and excellence. Through community service, participation in numerous character education programs, chapel, student-led spiritual retreats, practices of integrity, respect, and excellence are well grounded. The Honor Code affirms those practices and presents the code’s ideals as the expectation for everyone in the community.